Hello everyone, I am new to the GM forum, I am looking for help. I own a 2008 chevy Silverado truck and I had a mechanic try to repair a warning light. I don't know what the code was for the warning light. All I know right now is that the mechanic replaced a two parts called Throttle body assembly and accelerator pedal and the warning light went away but now my idle sounds rough. Is this normal ? The mechanic told me to drive it for a few day until it goes back to normal, Is this right? I need to make sure the vehicle is operates normal so i can get it to a smog station. Anyone out there that can please help .... Thank you !!! 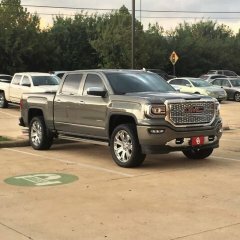 hey im new to the forum and wanted to know if there are any other towing mirrors available for a 2017 GMC Canyon other than clearview. Thanks! So I've read already that you can't integrate a factory brake controller in a vehicle that didn't come with one by simply plugging it in. My question is, if I purchase the factory controller, is there a way for me to modify it so that it works as an aftermarket controller i.e. not having to break the bank or put holes in my kick panel. 02 Sierra 2500hd 8.1 turn key to first click and starter cranks over engine starts and starter stays engaged. I have a 99 Silverado 1500 with the floor shift transfer case. I’ve been having an issue with my 4wd fuse on the interior fuse panel. Whenever I turn the key the fuse instantly blows wether I’m in 2wd or 4wd hi and low. I’ve seen around that that fuse is for the front axle actuator so I looked around and couldn’t find any obvious shorts, could it be a short in the motor itself? Rotor and hub assembly removal/replacement 2015 silverado 1500 LT 4x4 Long time lurker, first time poster I was in the process of changing the brakes and rotors, which was going fine until I got around to the passenger front. I get the caliper bracket off and get the brakes out of the way. Then that’s when i did it, I snapped off the tip of a t-30 torx bit in the head of the brake rotor torx bolt. I’ve tried everything that I can thing of to get it out. Ive tried to drill a small 1/16” hole in the center of the broken bit to have an edge to work with. I’ve tried hand impact tools to just work around it and get the bolt out with no luck. I’ve watched a bunch of good videos, but had no luck so far. That’s bring me to a possible ‘solution,’ as I have to change out the hub assembly,Moog 515160, anyway. I’m think that I could just remove the spindle nut, and the hub hardware bolts and that should release both the rotor and hub as one piece? Thanks in advance for any thoughts, info, guidance! I’ll get some pics to add tomorrow in the daylight. Mystery bolt fell off of my truck??? I was washing my '93 S10 when all of a sudden I see this bolt on my driveway. It's more of a stud with a totally round head. It's too thin to be a lug nut stud/wheel stud. I believe it came off of the right side of the truck due to its location on the driveway. What could this be??? Any ideas appreciated. P.S. It COULD have came off of my dad's 1967 F100. I will be posting it on the Ford forum as well. ANY ideas appreciated and if you know what this is please let me know! Truck started to make a squeaking noise this weekend, took it to the dealership on Monday. Dealership called Tuesday and said that they could not find anything wrong with the truck and that this sound is normal. Take a look at this video so that you can hear and understand what I am talking about. https://youtu.be/aERzjGAX-aU Does this sound normal to you guys? I also put water on the belt and the noise was persistent so it does not appear to be the belt. Any help would be greatly appreciated! So I think someone is trying to steal my truck. For the second time in a couple of months, I've discovered my window trim pulled up out of the channel right above the door handle. Unfortunately, my truck won't fit inside my garage since I added the lift. Is there any way I can prevent them from using such a tool to open my door? I need to replace my fuel tank on my 2006 Chevy Silverado Reg cab short bed 1500. I can not find a used fuel tank anywhere the has the two ports on either side of the fuel pump. Anyone have any idea of where I can get a used one?? Also, why does every other tank I see online only have one port next to the fuel pump, not two like mine?!?! 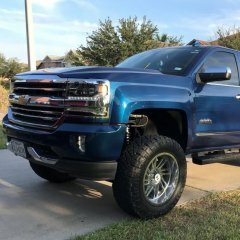 Hey guys, I have a 2017 Silverado High Country and I installed a 6in Fabtech lift with 35in nitto tires back in September 2017 and since then I've been having issues with my cruise control disengaging/turning off at anything above 69mph. When I'm traveling above 69mph, cruise control will turn on and illuminate on the dash, but it wont engage or lock on. Even when I have the cruise set at 65mph and I try to increase the speed to 70mph, it'll immediately cut off/disengage. I took it to the dealership around January 2018 and they told me since the truck has bigger/heavier tires, the computer is reading the wheels going slower than what it reads on the speedometer. They basically said I need to recalibrate the computer to read the new tire size. BUT, a friend of mine also said I could possibly need to re-gear to 4.56 since I'm running heavier tires, which could fix the cruise control cutting off. If anyone has experienced this issue, you help will be greatly appreciated. Thanks guys. The A/C belt in my 2004 Silverado 1500 4.8L snapped recently, and I believe it’s because one of the pulleys seized up. 2 days before the truck was making a relatively loud screech from the engine compartment at startup. The belt was a gator-type and installed on 12/10/17. I’m not an expert at engine repair, so what pulleys drive the A/C belt? And if one of them is truly seized, how do I properly fix it? Have noise coming from engine . Ideas ? Hi there! Man it's been a long time since I been on this site! That rusty 01 is long gone!! LOL Anyway, I have a dilemma, we just purchased a 2013 Yukon XL Denali (kind of a rushed purchase, figured I could deal with the moon roof, I was wrong). My question is, what can I do to get more head room in this thing? Are there any seat mods that can be done to give me a little more room? I am 6'3" and totally uncomfortable driving this beast! Any assistance would be greatly appreciated! Thanks!